We are engaged in offering an exclusive range of Pre-Printed Computer Stationery. All these products are environmental friendly and reliable in nature. Our products are backed by the member of our expert team. We offer advance technology products, which helps in fulfilling various purposes of our respected clients. Therefore, these products are widely appreciated in the industry. We are into manufacturing and supplying of computer stationary. Made using prime quality raw material, they are flawless quality and are available in a variety of options. Our range of stationery is available with sprocket holes present on both sides and makes it easy to print smoothly on dot matrix or line printers. The products are manufactured and designed to meet the specification of the clients and achieve their optimum satisfaction. Our range of Computer Stationery is provided in competitive prices. Our clients can avail from us a wide range of blank stationery. These stationery include the paper with sprocket holes on both sides. The papers are used on both dot matrix and line printer to generate the data. Our stationery is widely used to print accounting ledger, generating different types of technical data. The small forms are used to generate invoices and challan. Our clients can avail from us a wide range of Plain stationery. These stationery include the paper with sprocket holes on both sides. The papers are used on both dot matrix and line printer to generate the data. Our stationery is widely used to print accounting ledger, generating different types of technical data. The small forms are used to generate invoices and challan. Backed a diligent team of professionals, we offer our clients EZR computer stationery. The stationery includes papers with sprocket holes on both sides. 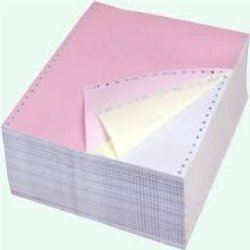 These papers are widely used on dot-matrix as well as line printer to produce the data. Our range is in adherence to international quality standards and is an economic way of printing data. Computer Stationery Last modified on: 21 Jan 2014 We are into manufacturing and supplying of computer stationary. Made using prime quality raw material, they are flawless quality and are available in a variety of options. Our range of stationery is available with sprocket holes present on both sides and makes it easy to print smoothly on dot matrix or line printers. The products are manufactured and designed to meet the specification of the clients and achieve their optimum satisfaction. Our range of Computer Stationery is provided in competitive prices.